London plays host to the Tour de France this weekend (I know, I know, nothing is as it seems anymore; they've even tried to bring the race to the US once). 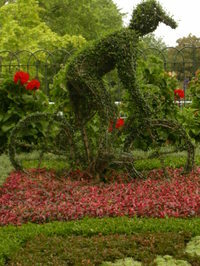 Tomorrow the riders compete in a time trial, racing through central London and Hyde Park where this photograph was taken. On Sunday the race leaves London for the first stage to Canterbury and then returns to France. I'd spotted this bedding display from the top deck of a bus the other day, tucked away along the edge of Rotten Row near Hyde Park Corner. I pedalled by on the way home this evening and I'm fairly sure not many have noticed it. I'd been getting annoyed with the Royal Parks authorities as they now seem to think it fine to flog off a public space for any number of events during the summer - so much so that it seems a good portion of Hyde Park was closed to (non) paying visitors for most of June. I must ask tourists what they think when they come to one of the worlds finest parks, perhaps on their way to Speakers' Corner or strolling from Marble Arch to Hyde Park Corner by Park Lane only to find ugly hoarding up, litter from last night's event and site traffic driving about. 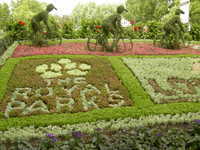 But credit where it's due to the gardeners who laid out this floral celebration of the Tour de France.